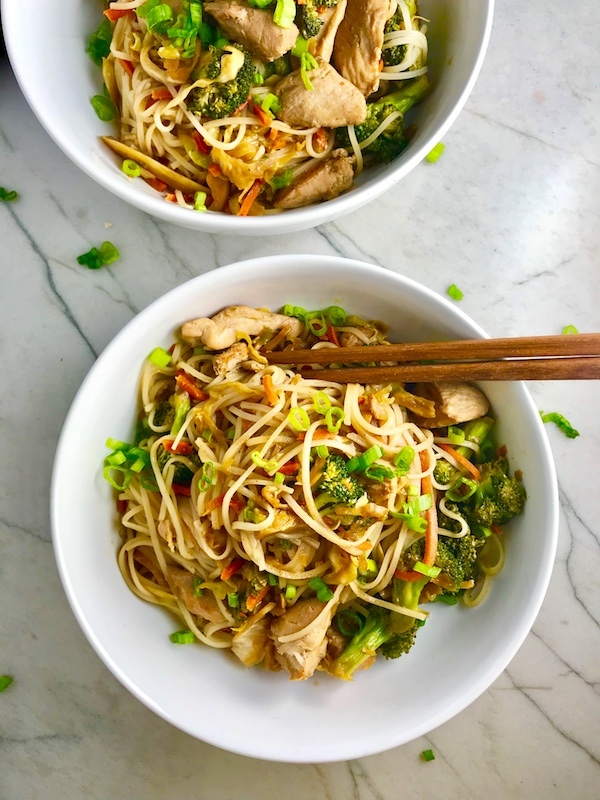 Teriyaki Peanut Sauce Chicken and Broccoli stir fry with rice noodles is a super simple, delicious, one pan weeknight dinner option. You get a simple, but complex flavor combo from the peanut butter, teriyaki sauce, and the sesame oil. It’s one of those sauces that if no one is watching, I may slurp up a spoonful of it and may even lick my bowl after to get every last drop. It’s that good. 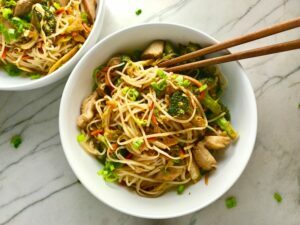 Mixed with the Chicken and Broccoli and then the rice noodles, it really is a perfectly delicious one pan dish. With the rice noodles, this is also a gluten-free dish. The noodles soak up the amazing teriyaki peanut sauce so you can slurp it up with every single bite. YUM. 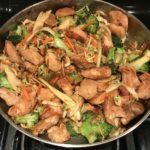 I love this easy recipe because I always have the ingredients on hand, it takes only minutes to whip up, and if I plan ahead, I can have everything prepped to cook so fast in a skillet. And…leftovers are terrific…hot or cold! 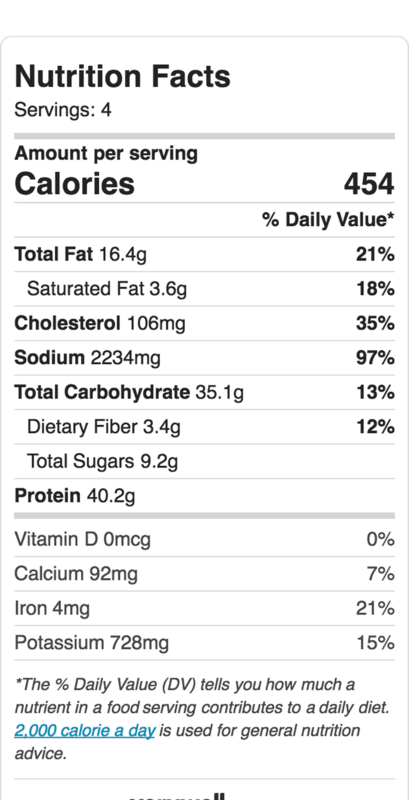 Here are the Key Ingredients and why I love them! 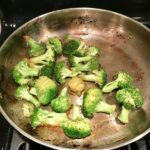 Broccoli – So healthy!! As a dark green veggie, it is loaded with vitamins and even CALCIUM! Plus, my kids love it, so its a win win. 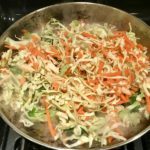 Coleslaw mix (shredded cabbage and carrots) – It’s summer and you are bound to find tons of coleslaw mix at the store, so this is a great way to use it in another way! Teriyaki Sauce – Another ingredient that I always keep on hand. I marinade chicken each week and toss it under the broiler for a quick dinner. The taste is amazing and pairs so nicely with the peanut butter and just about any protein or veggie. Sesame Oil – A little goes a long way here in terms of flavor, but more than the amazing depth of flavor it brings to a recipe, it is also great for hair and skin. It is rich in zinc which is often added to anti-aging skin products. Rice Noodles (Vermicelli) – I love, love, love rice noodles! They are gluten free, soak up flavors, and are terrific in hot or cold dishes. I use them not only in Asian recipes, but with just about any sauce! The chicken is simply marinated in teriyaki sauce. 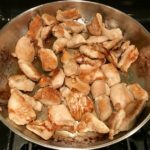 When the chicken soaks up the teriyaki for at least one hour, but up to a day in advance, it tenderizes the chicken as well as gives it incredible flavor. So when you cook it it stays moist, juicy, and so delicious. You can also prepare the broccoli florets and slice the scallions in advance. Finally, you can make the peanut sauce in advance and store in the fridge. The sauce is very simply peanut butter, teriyaki sauce, and sesame oil…but the flavor is unbelievable! 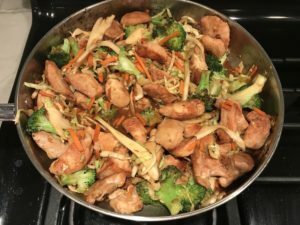 On the night you are ready to eat, you just need to cook the noodles and stir fry the chicken, broccoli, cabbage/carrot mix, and scallions with the sauce. 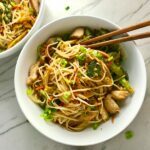 Peanut Teriyaki Chicken and Broccoli stir fry with rice noodles is a simple, delicious, one pan dinner option. It's also Gluten Free! 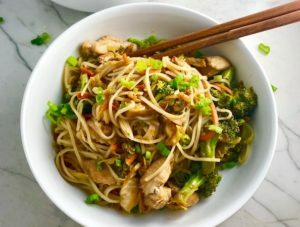 You get the amazing flavor from the combo of peanut butter, teriyaki sauce, and sesame oil mixed with the Chicken, Broccoli, cabbage, and rice noodles...YUM! 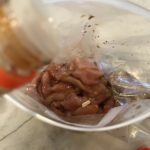 Cut the raw chicken into thin strips 1-inch in length and the put in a large storage bag covering with 1/2 cup of Teriyaki sauce. Seal the bag and squish the chicken around to completely cover each piece in the sauce. Put in the fridge for 1 hour up to over night. Cut broccoli florets to get about 2 cups. 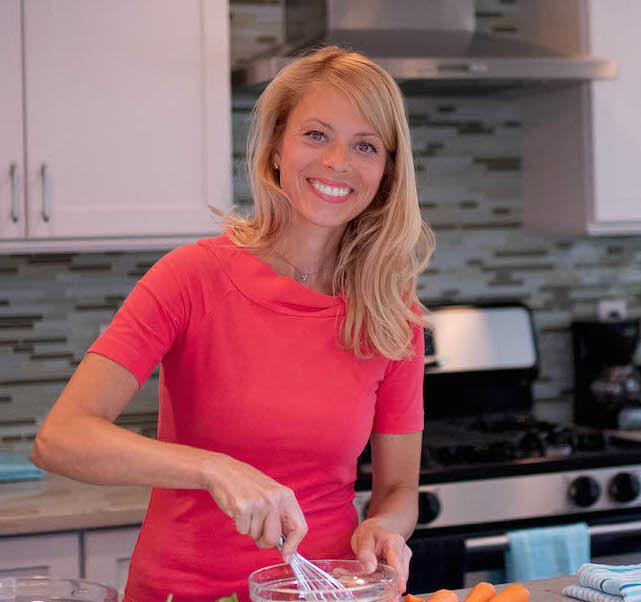 Make the sauce by measuring out 4 teaspoons of peanut butter and soften by either microwaving for 10 seconds or putting it in a glass container and submerging the bottom into hot water until softened. Once the peanut butter is softened enough to mix, add the 1/2 cup of teriyaki sauce and sesame oil. Whisk to completely combine. Cook the rice noodles according to package instructions. Be sure to thoroughly rinse the noodles after cooking to rinse off the excess starch before adding them to the stir fry. Preheat a large skillet and add 1 tsp extra virgin olive oil and the chicken. Spread the chicken into a single layer, but then leave it alone to sear on the bottom. After about 4 minutes, flip the chicken to sear it on the other side. Cook for another 5+ minutes until cooked through. Then remove the chicken and set aside on a plate. Add another tsp of Extra Virgin Olive Oil and the broccoli. Cook for just a few minutes until brighter green and starting to soften, but still crisp. Then add the 2 cups of coleslaw (cabbage and carrots) plus the scallions (leave some of the greens for garnish). Stir to combine and cook for another few minutes. Add back the chicken, add the peanut sauce, then add the noodles. Stir to completely combine. Serve and garnish with scallions. Enjoy!